1 of 3 In small bowl, combine chicken broth, orange juice, lemon juice, soy sauce, sesame oil, sugar, cornstarch and salt. 2 of 3 In very large (12-inch) nonstick skillet or wok, heat vegetable oil over medium-high heat. Add garlic and ginger; stir-fry 1 minute. Increase heat to high. Add scallops. Stir-fry until opaque, about 2 minutes. With slotted spoon, transfer scallops to clean bowl. 3 of 3 Add snow peas to skillet; stir-fry 2 minutes. Stir reserved broth mixture and add to skillet. Simmer 1 minute. 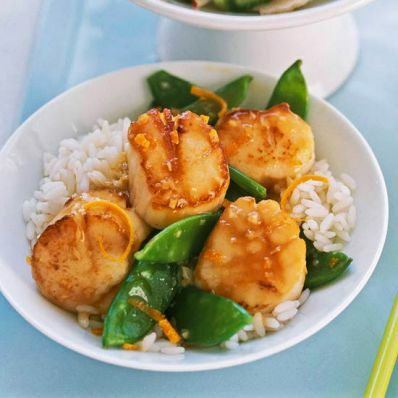 Add scallops back to skillet. Simmer 1 minute. Serve hot. Sprinkle with orange rind, if desired. Serve with Cucumber Salad, and rice, if desired. Makes 6 servings.